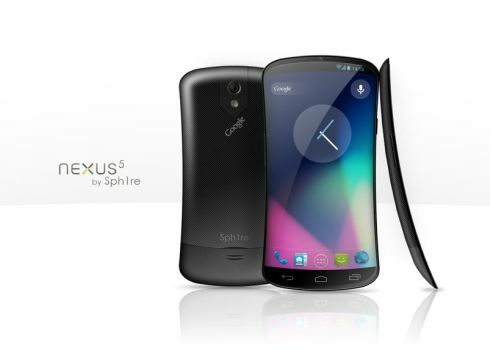 Designer Sph1re from Deviantart has created the next Nexus Phone concept, which he calls the Nexus 5. We’re dealing with a very rounded and curved handset here, both in profile and edges. It’s shaped like an hourglass and I am extremely curious how such a model would feel in the user’s hand. As you can see, the Nexus 5 phone runs Android 4.1 Jelly Bean, it has 3 capacitive buttons, classic for Android and a camera at the back with flash. WiFi and LTE should be available, as well as NFC and maybe the rumored quad core Snapdragon processor. There’s also a special lid at the back bottom area, that maybe hides the microSIM and microSD card slots. Seeing that this model is so curved and thin, it looks very fragile and there’s something about it that screams HTC and somehow… Alcatel?! The front camera integration doesn’t quite convince me, since it’s too close to the edge, but other than that I’m happy with this design. It may be a bit too curved to feel like a serious smartphone and it may look a bit too playful. However, I think it’s a breath of fresh air, with all those rectangles out there.